Leaders of a European research program plan to present findings at a meeting in Brussels next year describing their examination of methods for mixing carbon nanotubes — cylinders of carbon atoms — with copper to create lighter, more conductive power cables for aircraft and spacecraft. Large aircraft can carry over two tons of copper power cables. Using lighter alternatives would dramatically extend aircraft range, increase payload and reduce carbon emissions. Satellites would be lighter at launch and could carry more station keeping fuel to stay in their proper orbits longer. The 5.5 million euro UltraWire research project, which was started in 2013, includes 3.3 million euros ($3.8 million) from the European Commission and 1.7 million euros ($1.9 million) from industry. Researchers are examining how best to mix carbon nanotubes with copper in different configurations to create lighter power cables that also would carry more electric current than those in use today. For the moment, the researchers are giving no clues about the results of the program, because there are several patent and competitive issues that must be addressed before the results are announced in September 2016. Researchers are also studying production processes that would be scalable to large volume manufacture. UltraWire is the largest research project among various efforts in Europe, North America and China. Researchers are racing to develop the first industrial copper/carbon-nanotube products. Ultrawire includes researchers from the U.K., Germany, Belgium, France, Poland and Finland. The potential of the new compound was first proposed in June 2012 by Taysir Nayfeh, an associate professor at Cleveland State University in Ohio, and his research team. The team reported nanocarbon/copper wire with more than twice the conductivity of pure copper and with a potential to reach more than 100 times copper’s conductivity. The Ohio researchers discovered the theoretical benefits; the UltraWire team is combing theoretical understanding with experimentation to try to overcome the practical difficulties of industrializing the process. Parallel research at Rice University in Houston has shown that although individual nanotubes can transmit nearly 1,000 times more current than copper, nanotubes fail before this capacity can be reached when mixed with other materials. According to industry and academic experts, it is likely to be at least 10 years before an aerospace standard power cable made of the new compound takes to the skies in an operational aircraft. Aerospace engineers are not the only ones interested in this work. Cable manufacturers, power generators, automotive manufacturers and others involved in power transmission are investing heavily. 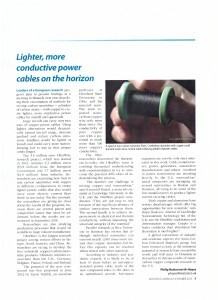 In the U.S., nanocarbon/metal companies are springing up around universities in Boston and Houston, all vying to be some of the first manufacturers to produce lighter current-carrying cables. A global consortium of industry and academic experts, the Nano-Carbon Enhanced Materials group, has been formed to look at the industrial potential of research from around the world and will meet in Houston in November to discuss results of nanocarbon copper composite research in the U.S.